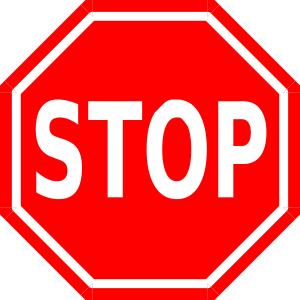 Car drivers, bicyclists and in-line skaters must come to a complete stop at STOP signs. 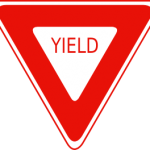 A yield sign means to slow down and be ready to stop. 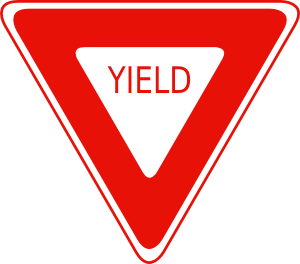 This is a one way street sign, car drivers must drive in the direction of the arrow. This is also a rule for bikers and in-line skaters. 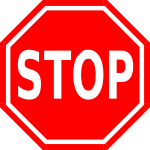 This sign means you are coming to a railroad crossing. Railroad tracks are uneven. You should not try to bicycle or in-line skate over them. Never go around a closed railroad gate. Always look and listen carefully to be sure a train is not coming before crossing the tracks. This sign means you are near a school. Look carefully to the left, right and left again before you cross the street. If you must walk through parked traffic, stop and look carefully before stepping out from between vehicles. Remember it’s hard for the bus drivers to see you. 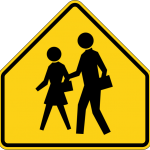 Don’t run to catch up with your friends or run between parked cars and buses.